There is already a patch to enable Windows 8 to be installed as a guest on ESXi 5.0 (http://kb.vmware.com/kb/2006859) but now VMware have released a complete update for the vSphere family. It’s simply vSphere 5.0 Update 1. 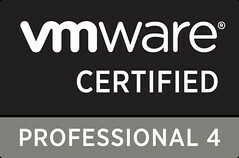 The things that excite me the most are that ESXi officially support Windows 8 and MAC OS X “Lion” 10.7.3. I look forward to cranking up the VMware View environment and bringing the guest operating systems right up to date. Security Update: In Update Manager 5.0 Update 1, the Microsoft SQL Server 2008 R2 database, the Oracle (Sun) JRE package and the certificate that is provided with Update Manager installation package are updated to address security related issues. Improved Product Usability: Update Manager 5.0 Update 1 provides upgrade release version information, improved maintenance mode impact differentiation, and a warning message that states a snapshot of fault tolerant virtual machines cannot be created during remediation. Improved Product Robustness: In Update Manager 5.0 Update 1, virtual appliance updates and the Update Manager server failure are handled in an improved manner.